Get lucky this February and play the best online slot machines at Slotastic Casino with free spins, freerolls, and free chips! Use the Slotastic no deposit bonus coupon codes listed below to claim your free chips and free spins this February and test your luck to win some free gambling money. New no deposit casino coupon codes will be added to the list as they are released throughout the month. 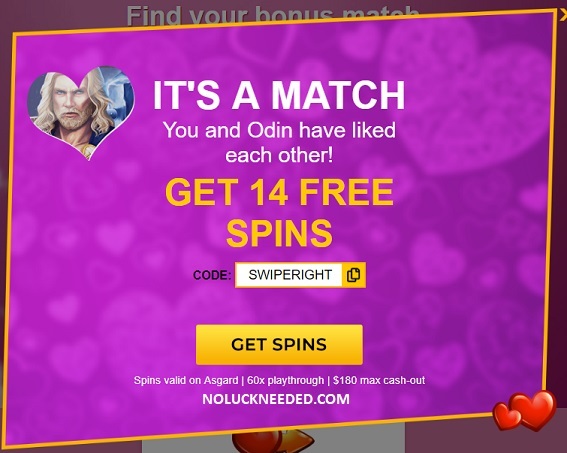 You can also check your casino cashier's coupon section for special Valentine's Day free spins bonus codes and promotions. Please share your own Slotastic coupon codes below in the comment section. GOOD LUCK! 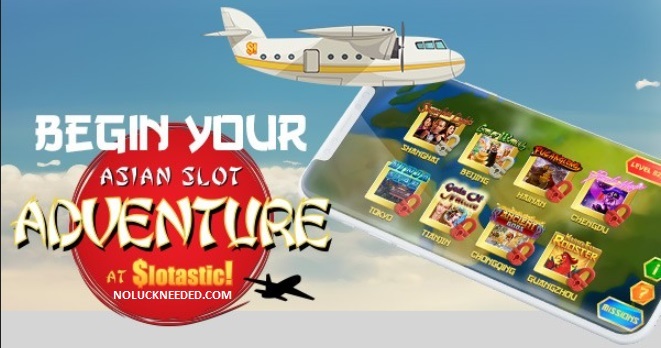 50 Free Spins New Players: Register a new Slotastic account after clicking the banner below and claim noluckneeded.com's exclusive 50 free spins no deposit bonus by redeeming the coupon code "NLN50FREE" in the casino cashier. Only one account per household is allowed. *The 50 Free Spins promo code is valid for new and existing NoLuckNeeded.com affiliated players. *Players are not allowed to use two free bonus coupons in a row. Playthrough: 60X; Maximum cashout: $180; Max bet rule applies. DID YOU VOTE FOR ASGARD? Claim your reward! If you voted for Asgard and redeemed coupon SSA19ASGARD, get 30 free spins for Asgard as an added reward! * 60X Playthrough | $180 max cash-out; Valid 2/25 until? Standard free bonus terms apply including max cashout, max bet and wagering requirements. How to get your bonus? Go to the cashier’s ‘Coupons’ section and enter coupon code CUBEE50 after making a deposit between 13.02 - 17.02. How to get your bonus? 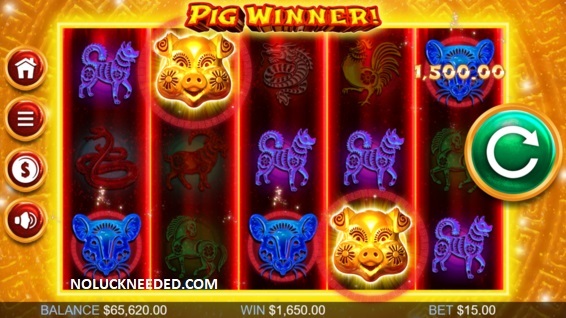 After making a deposit in January, go to the cashier’s ‘Coupons’ section and enter coupon code PIGREWARD. Slotastic Terms & Conditions apply. 60X Wagering Requirement; $180 Maximum Cashout. Max bet rule applies. Do not claim two free bonuses in a row. Valid January 31st until? How to get your weekly reward? 1) Deposit in the current week between Monday - Thursday. 2) Your coupon will be delivered to your 'Messages' on Friday. 60X Wagering Requirement; Probably $180 Maximum Cashout. Standard bonus terms apply. Max bet rule. Claim your February 2019 Free Chips and Free Spins at Slotastic Today! 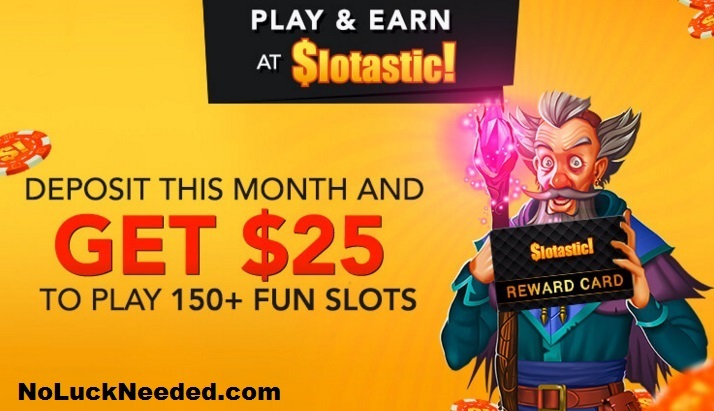 Slotastic is a NoLuckNeeded.com recommended online casino due to reliable player payments since 2009. 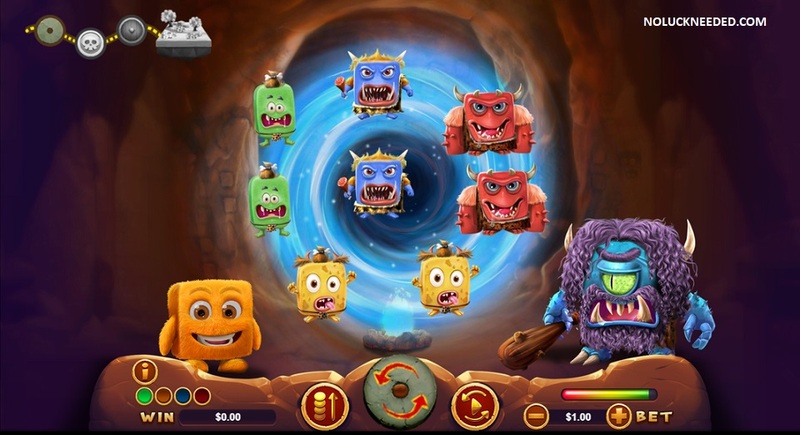 Slotastic is a Real Time Gaming software casino that is available for play on multiple platforms including mobile, instant-play and download. Slotastic now accepts Bitcoin for deposits and withdrawals. Click here to read or share Slotastic reviews, ratings, and complaints in the noluckneeded.com casino directory. Sign-ups from the following US States may be restricted at times: New York, Kentucky, Washington State, Maryland, New Jersey, Louisiana, Missouri. How to get your bonus? After making a deposit in January, go to the cashier’s ‘Coupons’ section and enter coupon code PIGREWARD. Slotastic Terms & Conditions apply. No Maximum Cashout! $25 minimum deposit. 40x slots wagering. Slotastic Terms & Conditions apply. Valid January 31st until? No Maximum Cashout! $35 minimum deposit. 60x slots wagering. Slotastic Terms & Conditions apply. Valid January 31st until? Pick your side today by redeeming your team's bonus below! If you choose the correct winner you'll receive a special surprise on February 4th*! Pick your winner now and stay tuned for your surprise. No max cashout. Standard bonus terms apply. $25 minimum deposit. *Players who choose the winning team's coupon will be notified via the message center on Feb 4th. 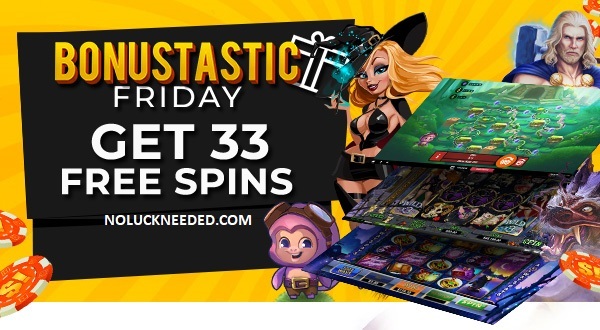 Get 33 Friday Free Spins at Slotastic Casino! Standard free bonus terms apply. Are you looking for an adventure in 2019? Join us as we embark on a journey around Asia at Slotastic this February with some of our favorite Asian-themed slot machines. Every Friday and Tuesday we'll be taking you to a new slot destination where you'll need to complete a small task to finish the mission and receive a bonus prize. $25 minimum deposit; No max cashout, standard bonus rules and wagering requirement. Expiration date unknown. $50 minimum deposit; No max cashout, standard bonus rules and wagering requirement. Expiration date unknown. Spins valid on Asgard | 60x playthrough | $180 max cash-out. $10 max bet.